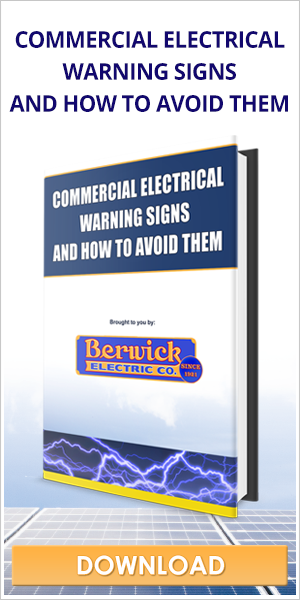 Berwick Electric Co. offers a wide range of electrical services, including Commercial, Residential, Industrial and DataComm. With a reputation rooted in excellent customer service, integrity, and cutting-edge technology, we have been a national leader in the electrical industry since 1921. We consistently thrive to maintain the best safety conditions at all job sites and our safety record speaks for itself. Corporate and social responsibility are top priorities here at Berwick Electric Co. and we take pride in making our local community stronger by regularly supporting various non-profits and local causes. Through four generations, Berwick Electric Co. has led the way for each new technological revolution. From electricity in turn-of-the-century carriage houses, to data centers and fiber optic cabling, Berwick Electric Co. brings power forward one decade at a time. Regardless of the technological revolutions that lie ahead, you can be sure that Berwick Electric Co. will lead the way. Looking to learn more about us? Read this article from the Gazette!